February seems like a month of new launches, and I'm lucky enough that I get to check out some of the products before their actual release. But as soon as this post goes up, most of the items would already be for sale in stores/online! 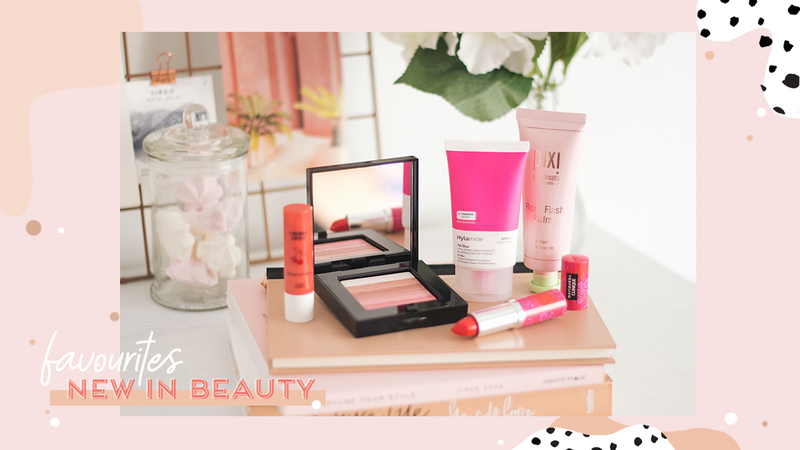 :) Read on to find out more about the beauty products that I've recently gotten, and why I LOVE them. Disclaimer: these products were sent to me but it does not affect my opinion on them. 1. 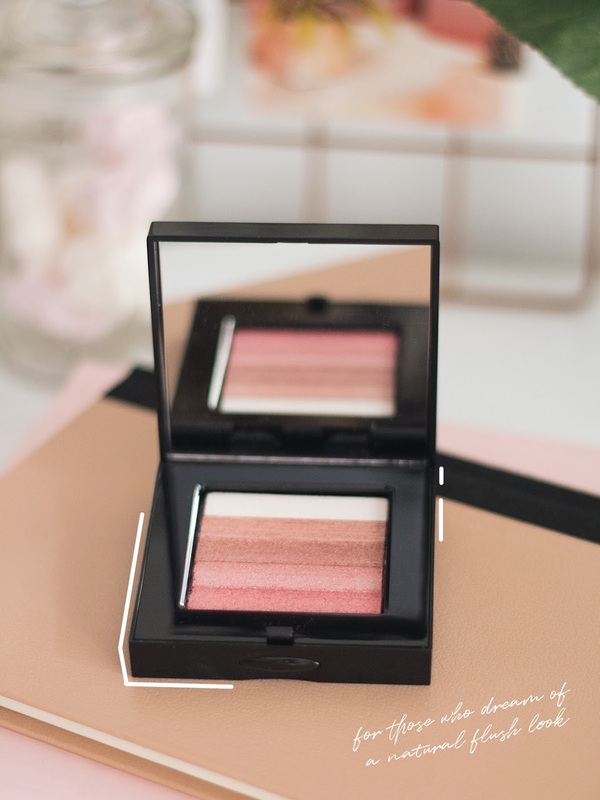 BOBBI BROWN SHIMMER BRICK IN ROSE: this blush is definitely not new in the market, but I recently got it and love it to bits. It gives you that natural rosy flush and subtle shimmer, so you can skip your highlighter and be out the door ;) IF you wish to add more highlight (because who says no to that), just sweep your brush over the lightest shade and on the high points of your cheekbones. 2. ETUDE HOUSE CHERRY SWEET LIP BALM: My current favourite lip balm ever since receiving it in the mail about a week ago. The shade that I'm using is BE101, a rosy tint (looks orange in the swatch but it's quite true to the bullet shade) that's great for days when you don't feel like wearing too much makeup. 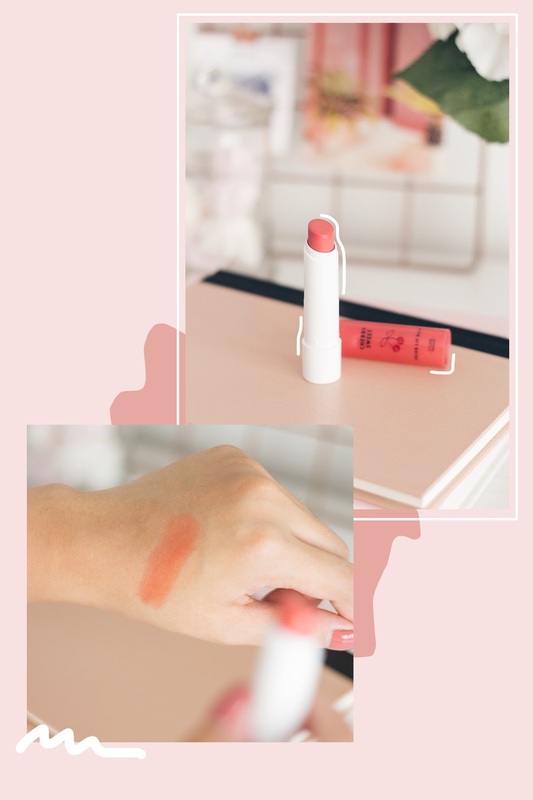 It has a sweet fragrance, slight sheen and very moisturising on the lips. 3. HYLAMIDE HA BLUR: a little goes a long way with this product. To be honest, I encountered some difficulties when I first started using it. On the packaging, the instructions are "Apply over or mixed with liquid foundation. Any powder makeup products should be used after the application of HA Blur". I followed and applied a small amount of the product on top of my liquid foundation but my foundation started breaking apart and became patchy. In the end, I found that the best method is by mixing it with a liquid foundation for an even and flawless look. 4. 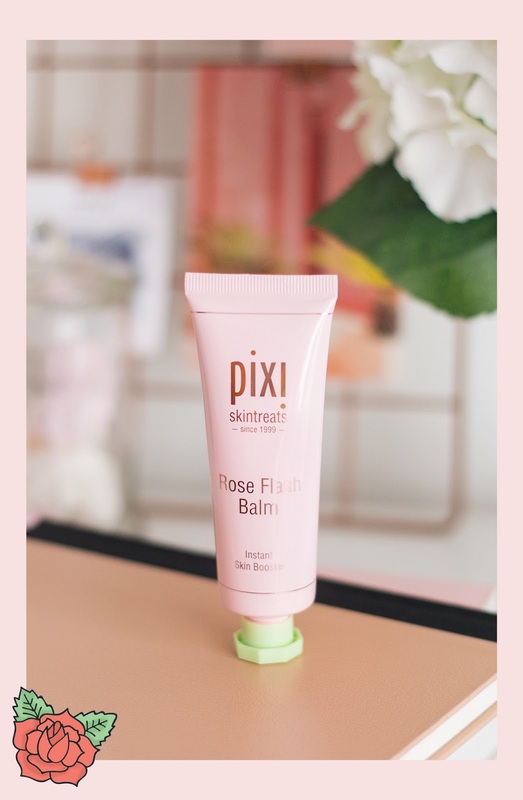 PIXI BEAUTY ROSE FLASH BALM: one of my new masking favourites that can also be used as a primer. While I've never tried to use it under my makeup, I thoroughly enjoyed using it as a instant skin booster. My first thoughts: YAS! It's rose scented (but not too overpowering), the texture and consistency feels thicker than regular masks. While in the shower, I apply a generous layer over my face and neck and leave it on for about 5-10 minutes. Wash it off with lukewarm water and my skin feels moisturised, which makes it a real treat for those with dry skin/live in dryer climates. 5. 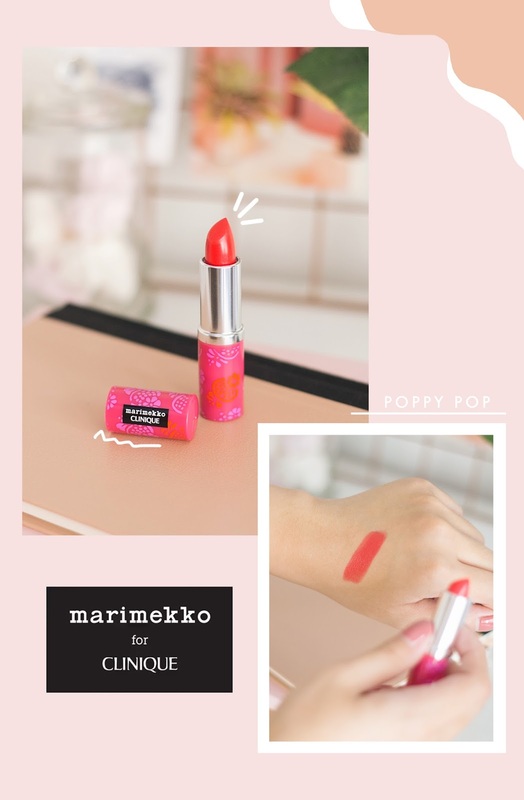 MARIMEKKO X CLINIQUE LIPSTICK: The Marimekko for Clinique collection features limited edition designs for both the lipsticks and lipglosses. If you're interested, I definitely recommend you to go check it out at Sephora ASAP! The shade that I chose was Poppy Pop – a saturated shade of orange-red. While the colour payoff is amazing, it's not full coverage on the first application, but you can build up for a more opaque coverage. Nonetheless, it glides on smoothly on the lips without emphasising any lip lines, has a satin finish and lasts several hours. 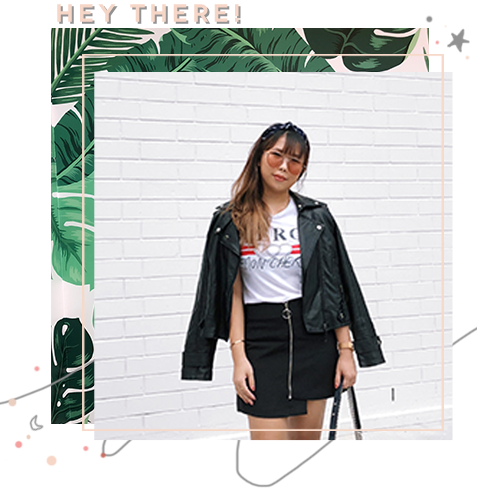 Your blog is the cutest! I wanna try that lippie from CLinique. It looks moisturizing! on a side note, i REALLY love the way you edit your photos!!!!! ITS REALLY AWESOME. keep going! Favourite moment is dressing up for cny bainian and feasting on all the yummy food! Would love to try that etude house lip balm! Looks so pretty!! Love your blog layout. It's really relaxing to look at! I really really love your blog. Is sooooo Amazing and creative. My favorite moment of February was when i found out I would be going on vacation for my Birthday, and when me and my boyfriend finally decided to work out some lingering problems because it's made such a huge difference in my life. My favourite moment in Feb was being able to take a breather from academics & spend time chilling with my family & relatives over food and card games!!! :-) & not to mention really fattening goodies & messy yushengs! Favourite moment in Feb: getting a week off from school just to lounge at home and do completely nothing and to recover from the CNY festivities!